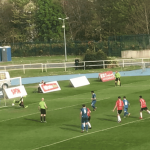 The date and venue for the FAI Cup tie between Waterford FC and Skerries Town FC has been fixed. Waterford FC fell to successive defeats after a 2-1 loss at the hands of Limerick in the Markets Field on Friday night. Waterford FC is delighted to announce the signings of Latvian international Renārs Rode and former Blues midfielder Cory Galvin. Waterford FC will look to bounce back from Sunday’s defeat with a visit to the Markets Field to face Limerick this Friday. 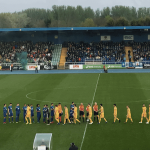 A single Gary Shaw second-half goal downed Waterford FC as Shamrock Rovers left the RSC with three points after a 1-0 win. Third face fourth this Sunday as Waterford FC welcome Shamrock Rovers to the RSC in a crunch SSE Airtricity League Premier Division clash. eirSport have announced they will broadcast Waterford FC's upcoming SSE Airtricity League Premier Division match versus Cork City. Applications are being taken for a new Kit Manager role at Waterford FC Academy. Waterford FC are delighted to welcome Ray Power into the role of Head of Youth Development at the club.